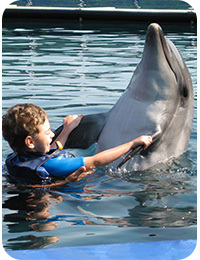 A Dolphin-assisted therapy together with specially trained marine biological psychologists enable children with mental or physical handicaps to find new ways to health. 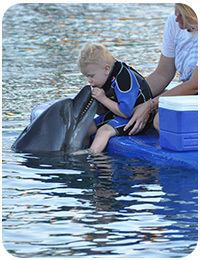 Techniques have been developed for the dolphin-assisted therapy that build-up contact to specially trained dolphins. 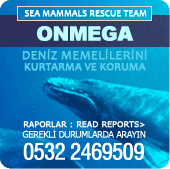 Under the supervision of the doctors and a dolphin trainer the dolphins understand that they should make contact with the patient. This opens possibilities that no medication or doctor could provide. It is most probable that the dolphins can feel the vibrations of a malfunctioning organ through their probing with ultrasonic waves (is being researched). Moreover it has been proved that through the sonic waves the spine and brain come into a resonance that stimulates the production of substances in the nervous system that in turn improve the functioning of the nervous system as a whole. Stress, fear and tension are lessened through contact with a dolphin. One receives positive energy and is freed from negative emotions. In ten sessions the course of the complete therapy is individually specified, according to the grade of the mental or physical handicap. The appraisals are reached through a discussion between the parents, the patient and the doctors, before and after the therapy. After each therapy session the positive emotions and sensations of the patient are checked together with the parents. The interactions of intensive physiotherapy, logopaedic and homeopathic treatment from experienced doctors, together with the dolphin therapy enable an optimal compact holiday course with consultations and counsel, and the best possible health improvement for handicapped children. Experienced doctors and therapists progress carefully with a made-to-measure programme for the patient without creating too much strain or stress for the child. Former therapies cannot nearly match the prodigious improvements in health that are induced by playing with the dolphins. Children suddenly can laugh or move freely that they have not been able to do before. They can speak their first words, awake laughing out of their half coma or they can do things that they failed to accomplish in previous therapies.